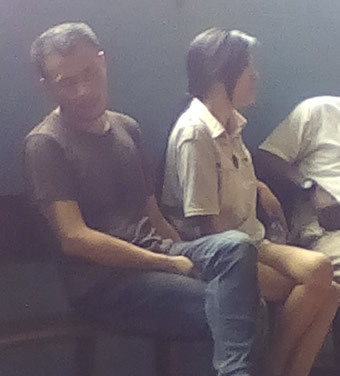 There was a mild drama at the Ebute-Meta Magistrate’s Court on Wednesday after two Chinese lovers – Zhen Zhen, female (47) and Leo Jian Feng, male (41) – engaged in fisticuffs on the court premises. They assaulted each other shortly after their handcuffs were removed by the police. It took the intervention of court officials to stop the duo from injuring each other. They were later called to the dock to answer to charges of alleged arson. PUNCH Metro was told that the duo had checked into the Ernest Hotel in Ikeja on July 4. They were alleged to have set the facility on fire while smoking some substance. They were subsequently arrested after firefighters of the Lagos State Fire Service put out the inferno. The suspects were arraigned on two counts of arson. The charge read in part, “That you, Zhen Zhen and Leo Jian Feng, both Chinese, on July 5, 2016, at about 2am at Bamishele Street, off Allen Avenue, Ikeja, Lagos, in the Lagos Magisterial District, did conspire among yourselves to commit felony to wit: arson. The police prosecutor, Sergeant Olatunde Kehinde, said the offence was punishable under sections 409 and 339 of the Criminal Law of Lagos State, Nigeria, 2011. The prosecutor announced the presence of the Investigating Police Officer, Ernest Nwanyanwu of the State Criminal Investigation and Intelligence Department; a representative of the hotel, Muhammed Shubero; and a representative of the Chinese embassy. The magistrate, M.O. Ope-Agbe, called the representative of the hotel to explain what transpired on the day of the incident. According to Shubero, the lovers lodged in the hotel on July 4 after necessary documentation. He said, “Around 2am on July 5, one of the hotel attendants smelt cigarette from their room. She went there and warned them that smoking was prohibited in that arena. However, they ignored her. Shubero said the hotel attendant and the security guard were ready to testify in court. However, the Chinese couple, who spoke through an interpreter, denied being responsible for the fire that burnt the hotel. Feng, in his defence, said he never smoked in the facility. Zhen, who also denied smoking, said she had slept off , but suddenly woke up to discover that the hotel was on fire and she ran for her life. The representative of the Chinese embassy told the court that he had gone to the police to get the details of the case when he was told it was being taken to court. The magistrate, Ope-Agbe, granted the defendants bail in the sum of N2m each with two sureties each in like sum. The case was adjourned till July 22, 2016, for mention.